I have previously ranted a few times about why a RAID 5 is a terrible idea for storing your Transaction Log, and why it is also very risky to store your data files on a RAID 5 volume. But in today’s blog post I want to show you how the RAID 5 parity information is actually calculated, and how it can be used to reconstruct the data in the case of a failure. 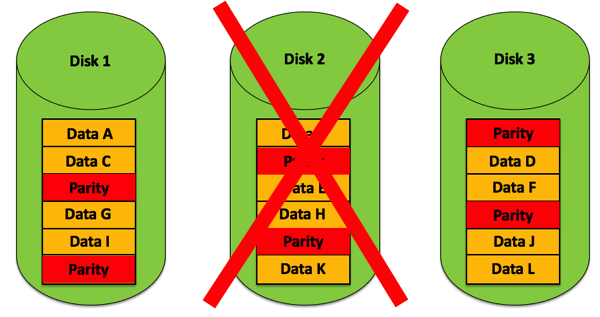 In a RAID5 array you need at least 3 disks where one disk stores the so-called Parity Information. The following picture shows this concept. The parity information is calculated during the writing, and can be used to reconstruct the data when one disk crashes. That’s pretty amazing: if one of the disks in the RAID 5 array crashes, the lost data can be reconstructed using that parity information. As you can see from the truth table, the output of the XOR logic gate is only 1 if both inputs are different. If both inputs are the same, the output of the XOR logic gate is 0. And that’s already everything that you need to know to be able to calculate parity information in a RAID 5 array. Let’s have a look now at how the RAID 5 parity information can be calculated. Imagine we have 3 disks, and one disk stores the parity information for us. 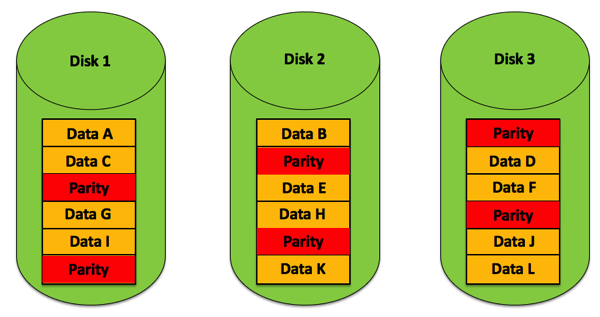 Calculating the parity information is quite simple: you just apply a XOR operation between the data that is stored on the other 2 disks. The XOR operation between the value ‘a’ and the parity information returns the value ‘b’. This is awesome! We have done the parity calculation just for one byte (8 bits) here, but in reality a RAID 5 controller is doing that work based on the Stripe Unit Size which is normally at least 64kb large. Until now everything was easy. Imagine now you want to change existing data in a RAID 5 array. In this case you would want to recalculate the parity information with the least amount of work. From a performance perspective it would be terrible if you had to read all the data of a stripe to recalculate the new parity information when you change existing data. The other character value ‘b’ (which was stored on our second disk) wasn’t read here – that’s very important! The result of that XOR operation is the decimal value of 1, which is our new parity information! And based on the new parity information we can again calculate the other lost data – in our present case the character values ‘c’ and ‘b’. The first time that you look at a RAID 5, you think that some magic is involved, because based on the parity information you can reconstruct 2 different pieces of information. But when you look at the details at the low level you can see that there is no magic – it’s a simple XOR logic operation that makes everything possible.